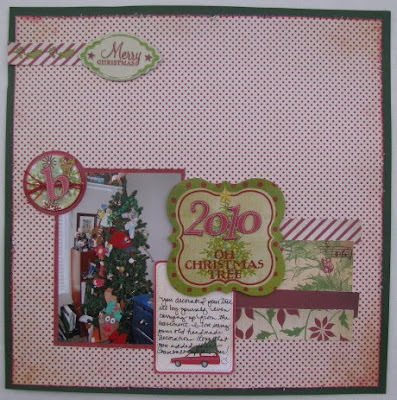 I had some more Shannon Zickel layouts that I wanted to scraplift that matched up with Christmas photos, but I was out of the Echo Park Christmas line. (Remember all the layouts I made with that line over the weekend? See here.) I decided to pull out my Noel Mignon "Bedford Falls" kit. For my first layout, I wanted to use one of Shannon's layouts that had a big arrow on the page. Since the Christmas patterns I selected seemed more formal, I opted to leave off the arrow. This layout is more of an "inspired by" page than a scraplift. The main elements on this page that I pulled from Shannon's original include the strips to the right of the photo and the monogram circle wrapped in twine in the upper left corner of the page. Layout #2 is a scraplift! I even pulled out my Scenic Route notebook paper for the background. Love the button! I always have bare buttons but wish they were tied! Maybe you'll inspire me! Amy you have been on a roll and I just got caught up in your latest layouts...all of them beautiful. I have also noticed that you are using more light background papers for your layouts. Love them all! I really like the white string on the button, too! Such a great look!